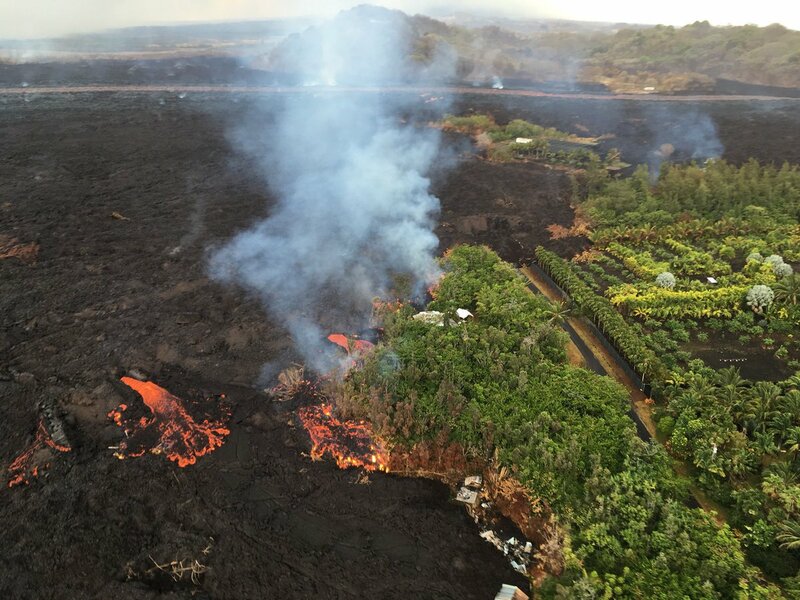 Exactly 8 weeks after the Lower East Rift Zone eruption began in Leilani Estates on May 3, Fissure 8 continues to gush unabated. Its fountains are contained within its 55-meter (180 ft) cone, and this morning’s overflight showed no active overflows. 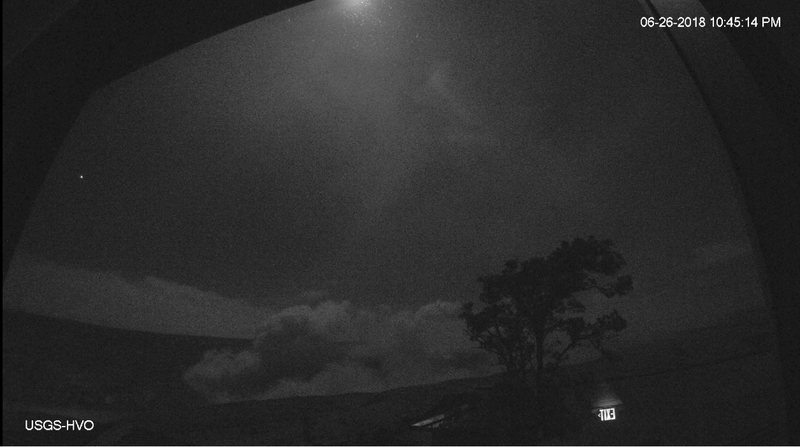 At Kilauea’s summit, the most recent collapse explosion occurred at 4:49am this morning, sending up an ash-poor plume about 1000 feet, with the energy release of a 5.3 earthquake. 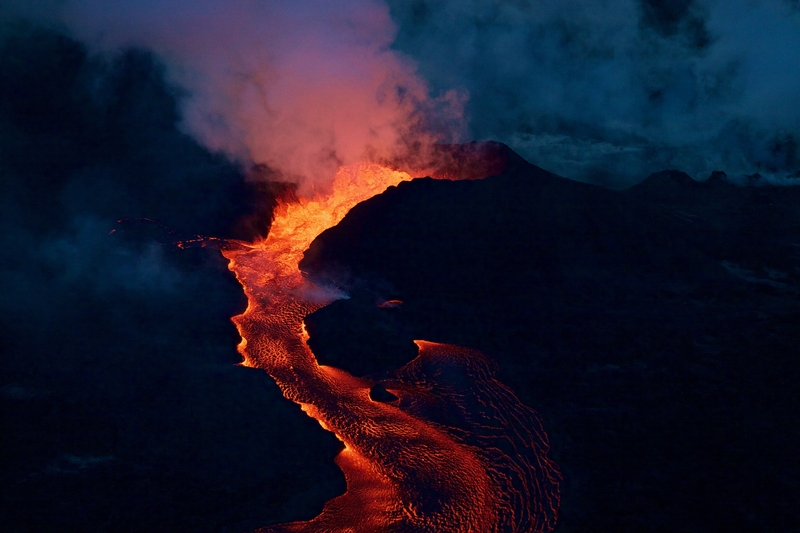 The sides of Halema’uma’u continue to collapse inward and downwards, especially during each explosive event. 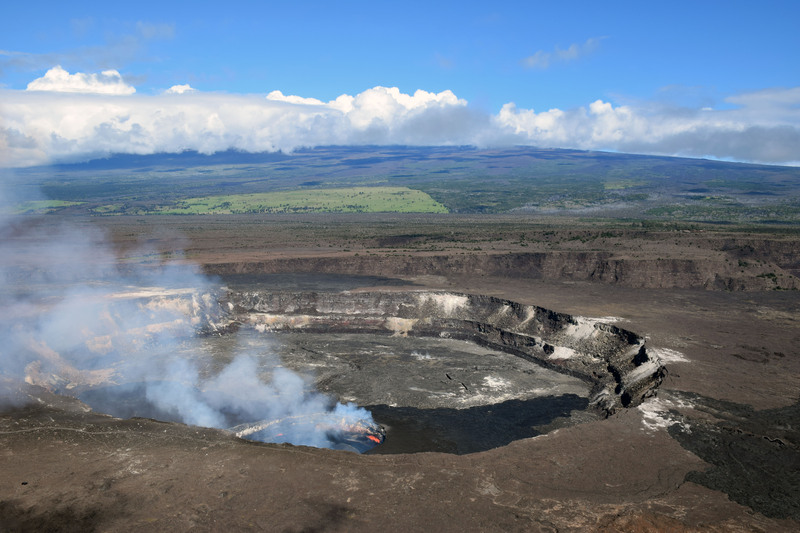 The big news today is that the National Park Service and USGS arranged a brief escorted tour for local news media to the rim of Kilauea Caldera, which has been closed to visitors for 49 days. There was also a half hour press briefing. In fact, I’m going to put the news media links before the science segment of today’s post. Boldfaced articles include quotes, videos, and/or photos from the media summit tour. 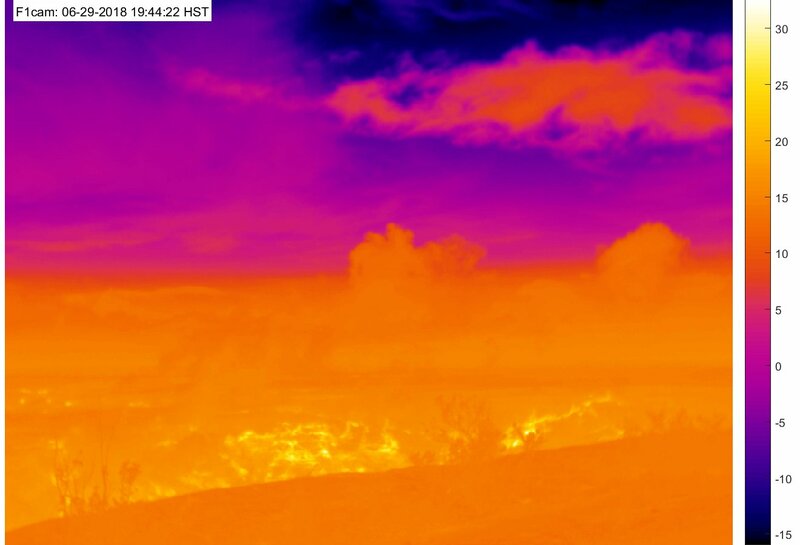 On June 26, 2018, Deputy Scientist-in-Chief of the Hawaii Volcano Observatory, Steve Brantley, gave a ten-minute slideshow at the Puna Community Meeting in Pahoa. Video of the meeting is posted here. Steve Brantley’s talk starts at 35:00 in that video. Below is my transcript of the complete talk, including images that match or approximate his slides. Hello, everybody. Thank you for coming out. 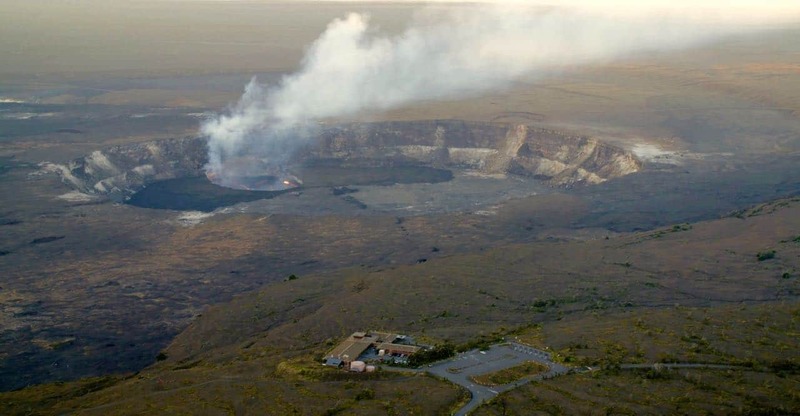 I’ll just describe a few things occurring in the Lower East Rift Zone and then summarize the activity up at the summit at the very end. 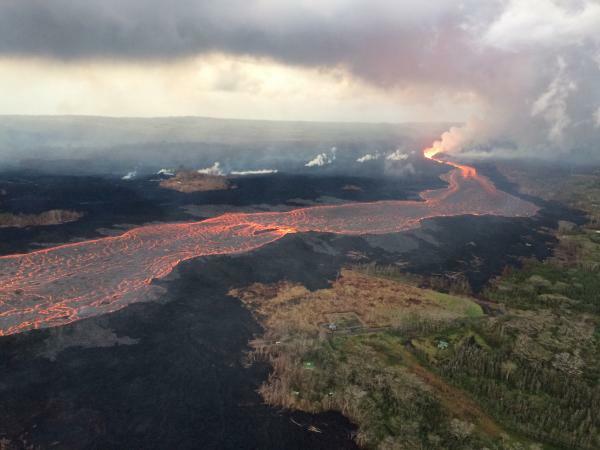 Fissure 8 is status quo. 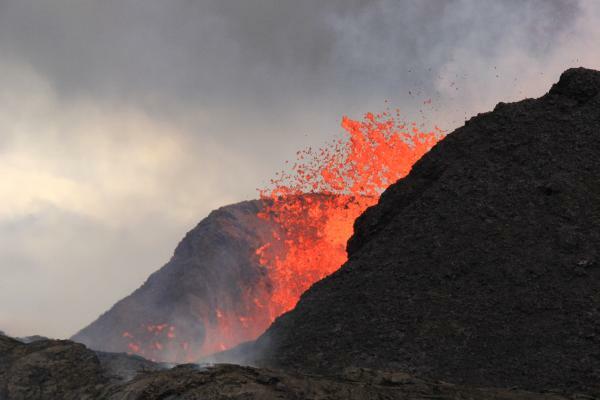 Today’s HVO Kiluaea status report says its cone is now 180feet tall. 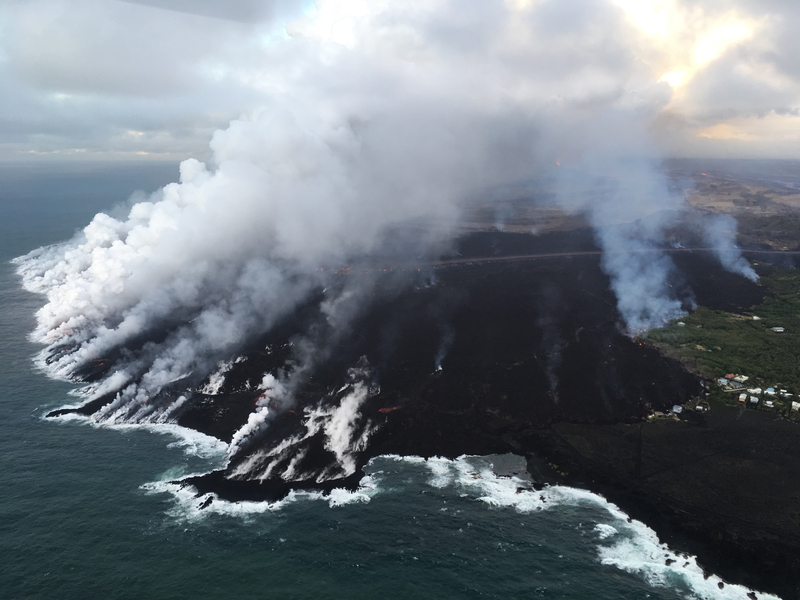 Its flow front has broadened southwards, widening to two miles, moving south on shore as well as continuing to expand offshore (lava delta acreage: ~405). 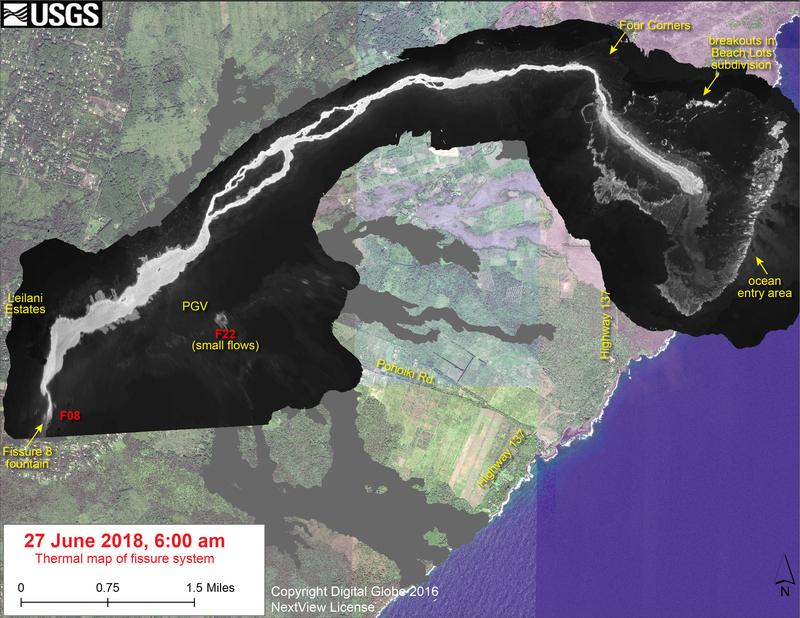 The main channel/ocean entry remains on the southern side of the front, with minor entries in a 1-kilometer zone. The lava Fissure 22 is weakly active; no activity observed at 16/18. 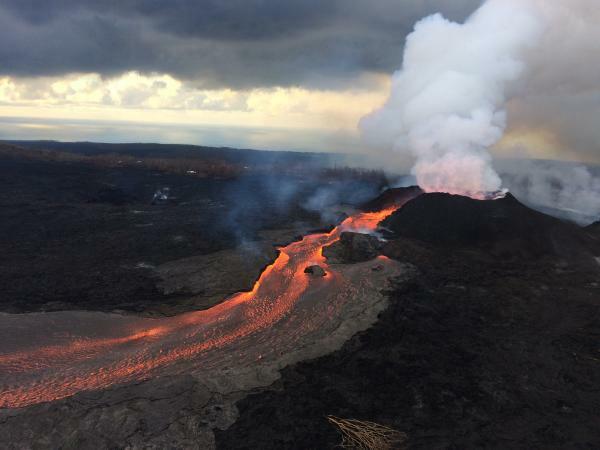 According to Mike Zoeller (UHI) at today’s 11AM conference call, the lava delta is advancing at less than 50m/day; it was 200/day a week ago. 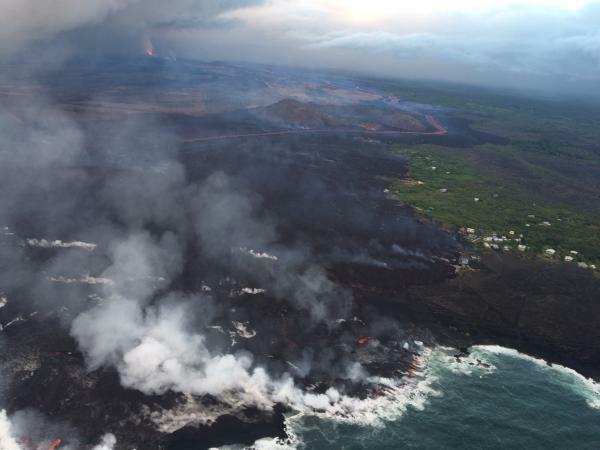 The southern edge of the flow is a kilometer from Ahalanui Beach Park. 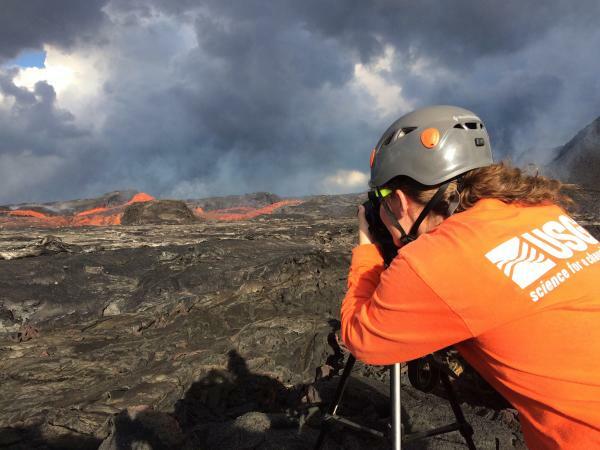 Over the weekend, he observed top lava speeds of 25kph (15.5mph); Leslie Gordon (USGS) saw it max out at 35kph (21.75mph) last Friday night. After yesterday’s collapse explosion at 4:12, seismicity dropped from a high of 25-35 quakes an hour down to less than 10, but had started to creep up again and was averaging 30 by dawn. 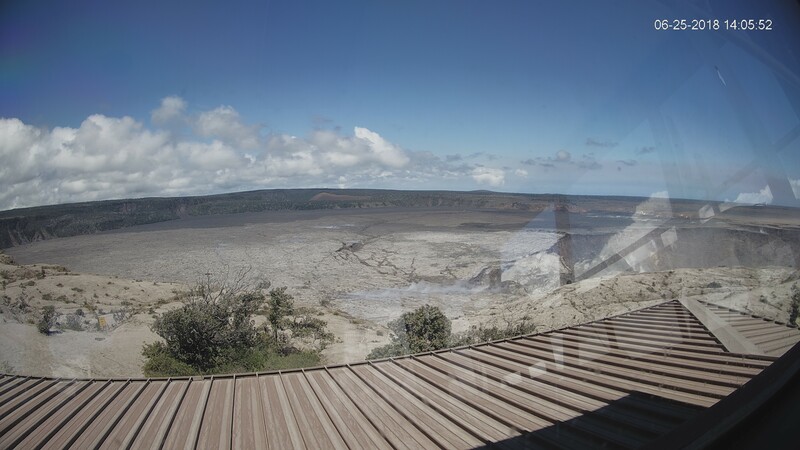 On the livestream, I observed clouds of ash/dust in the crater’s interior at various times during the day. Today’s collapse explosion occurred at 5:03pm, equivalent of a 5.3, ash-poor plume rising less than 2000 feet. Reminder: HVO downgraded Kilauea’s aviation alert to ORANGE last night, because ash explosions have rarely risen above 10,000 feet since May.